Album Review: Cheap Trick, "We're All Alright!" They want you to want to rock. File this one in the “Didn’t See That Coming” Department. The battle of Top Rock Album Of 2017 is shaping up between Queens of the Stone Age for Villains, Foo Fighters’ Concrete and Gold, and Cheap Trick’s We’re All Alright! No joke, the resurrection of Cheap Trick continues at pace after last year’s shockingly great Bang, Zoom, Crazy…Hello. I supposed I shouldn’t be so shocked. For years, guitarist Rick Nielsen has protested that the world got it wrong. Sure, the moment the record execs saw Robin Zander and Tom Peterssen they thought, “pop idols!” But the band was, in their estimation, always an angry, pull-down-the-wallpaper rock and roll band, and occasionally got to show it (like on their debut album). But that came out 40 years ago. Can they really be up to such roughhouse redecorating at this age? Every year, older bands put out albums and claim they rival the early material the world first fell in love with. Most of the time, the promises remain unkept and the audience underserved. 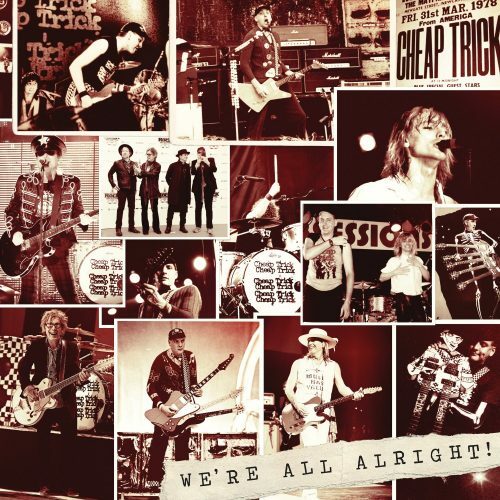 With We’re All Alright!, Cheap Trick delivers on every vow, and busts down doors doing it.